The information that follows is designed to aid the public, local and state officials, the media and all others with an interest in Kentucky to better understand the importance and value of the tourism industry to our state. Tourism is the world’s largest industry. Kentucky offers visitor experiences unlike anyplace else in the world. Tourism contributes over $15 billion to Kentucky’s economy. 195,503 Kentucky jobs are supported by tourism. Tourism jobs include highly skilled, highly paid technical, managerial and professional positions; entrepreneurial opportunities; and employment for lesser skilled and young workers. Tourism enhances Kentuckians’ quality of life. Every dollar of state advertising of Kentucky generates $151 in visitor expenditures and over $15 in state and local tax revenue. Kentucky tourism markets Kentucky products. Tourism and tourism marketing builds awareness of what is good and positive about Kentucky. Kentucky tourism is a thoroughly statewide industry, that is large, diverse, and consists largely of small businesses. Tourism is a major Kentucky export. Kentucky is increasingly receiving media attention as a travel destination. Kentucky’s tourism advertising is the lowest funded of all states in the southeast U.S. and among the lowest among all 50 states. Among prospective visitors there is limited awareness of what Kentucky offers. There is a significant need for more of our leaders to embrace tourism as one of the state's most important and valuable industries. In addition to limited funds, dedicated tourism funds are at risk of being diverted to non-tourism uses. Kentucky tourism is a sleeping giant. Traveling a distance of at least 50 miles from one’s home is often cited as a criterion that serves to distinguish a tourist and in turn tourism. While an exact distance someone must travel to be engaging in tourism is subject to debate, the more important point is that tourism is visiting someplace other than where one lives. A helpful framework for understanding tourism is to understand that at one end of the tourism pipeline there are an enormous number of people who travel for an enormous number of reasons. At the other end of the pipeline are an enormous number of possible destinations and an enormous number of businesses that serve visitors. Positioned between the travelers and the destinations and businesses are the enormously competitive marketing and advertising efforts to attract visitors. This framework and the enormity of each of its elements underscore the also enormous economic benefits of tourism. Kentucky possesses what any tourism destination must have as a foundation for success in the hotly competitive destination marketing arena. That foundation must consist of a varied set of authentic and compelling experiences, some of which are unique to the destination. Experiences related to bourbon and horses, two authentic Kentucky icons, are as unique to Kentucky as they are compelling for visitors. However, Kentucky possesses far more than bourbon and horses to attract visitors. Its outdoor recreation and adventure, historical and cultural offerings, Bluegrass and other music genres, its own special version of Southern cuisine, folk art and craft and the artisans who create them, and authentic small towns and urban excitement all comprise Kentucky’s portfolio of tourism assets. Two others are often noted by visitors and are reflected in Kentucky tourism research: the beauty of the state and the friendly and hospitable people who live here. The full array of Kentucky’s assets forms a mosaic of experiences unlike anyplace else in the world. Expenditures - Visitor expenditures and expenditures by businesses patronized by visitors contributed over $15 billion to Kentucky’s economy, exceeding that of coal and agriculture, and was only exceeded slightly by the automotive industry. Jobs - Tourism supports nearly 195,503 Kentucky jobs. Quantity is not the only value of the jobs tourism creates for Kentuckians. The range of job-types is also strength. The mix of tourism jobs includes highly skilled, highly paid technical, managerial and professional positions. Additionally, tourism activities are especially suited to entrepreneurial initiative. Tourism also generates a significant number of employment opportunities for lesser skilled workers and many tourism jobs provide an excellent training ground for young workers. Tax Revenue - A vital by-product of a thriving industry’s infusion of money into the economy and jobs creation is that the industry also generates significant amounts of local and state tax revenue. Tourism in Kentucky generates $1.57 billion in tax revenues in government. This amount far exceeds tax revenue invested in governments’ tourism marketing and in the operation of public facilities and attractions that serve visitors. The net effect, therefore, is that the tax revenue generated by tourism is a significant source of funds for non-tourism governmental services and operations. Return on Investment - Tourism's ROI is one of its greatest assets. A study by the Kentucky Department of Travel and Tourism found that for every dollar of state advertising of Kentucky, $151 is generated in visitor expenditures. The same study found that over $15 in state and local tax revenue is generated by every dollar of advertising. Kentucky Tourism Markets Kentucky - Experiences that attract visitors add significantly to Kentuckians’ quality of life, one of the key elements in attracting new business to the state. Tourism marketing is also a source of Kentucky product marketing. Kentucky bourbon, horses, automobiles, agriculture, and art are simultaneously important as Kentucky products and as compelling visitor experiences. Marketing the experiences builds demand for the products. In broader terms, tourism marketing builds awareness of what is good and positive about Kentucky, one of the few concerted national and international efforts that counters the sometimes negative pictures painted of the state. Unlike some other important Kentucky industries, tourism is not limited to certain regions of the state or to either rural or urban settings. Kentucky tourism is a thoroughly statewide industry. Every region and every legislative district benefits from tourism. Although Kentucky’s tourism industry includes a number of large companies, it consists largely of small businesses. The industry provides fertile ground for entrepreneurs. Exports, the purchase of products by those who don’t live where the product is made, are an important and valued component in any economy. The Kentucky tourism industry is an exporter, with the buyers living elsewhere and purchasing the Kentucky tourism product. As these buyers take their memories home, they leave their money in Kentucky. Tourism marketing only succeeds as a public - private partnership. Advertising and promotion by industry businesses is essential. However, those efforts are focused on the individual business and are limited in their ability to increase Kentucky destination awareness and demand. Therefore, statewide and local public sector marketing is also essential. The Kentucky Department of Tourism (KDT) is responsible for marketing Kentucky as a tourism destination. Tourist commissions, also known as convention & visitors bureaus, engage in marketing local destinations. KDT operating and personnel costs are included in the state’s General Fund budget. A one-percent statewide hotel room tax is the sole source of funding for all KDT advertising and marketing, including a program that provides matching funds for local tourist commissions. Tourist commissions, which are established in state statute, are primarily funded by local hotel room taxes enacted by the city and/or county served by the commission. Smaller cities are also allowed by state statute to enact a restaurant tax with all of those monies required by statute to be provided to the city’s tourist commission. Commissions are eligible to receive matching funds from KDTT and some receive funds from other sources. Kentucky’s greatest opportunity is found in its potential. Kentucky tourism is a sleeping giant. Today’s travelers are seeking precisely what Kentucky offers - authentic experiences. 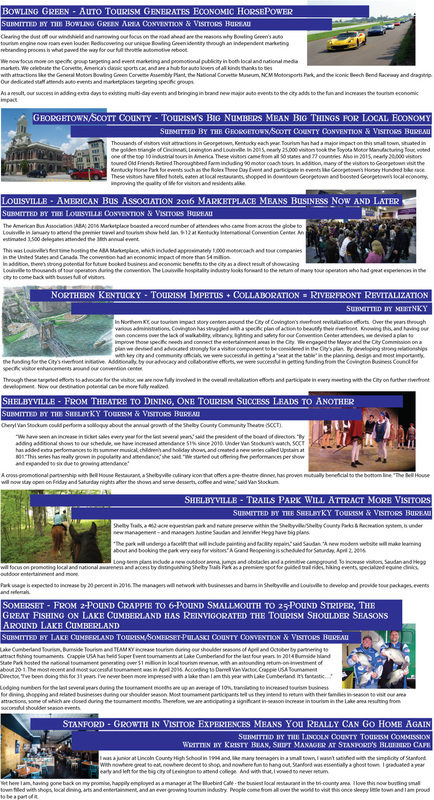 Despite the challenges to be discussed below, Kentucky is increasingly receiving media attention as a travel destination, including for international visitors seeking the “real” America. Unfortunately, challenges are significant and represent major barriers to Kentucky tourism realizing its full potential. At the heart of those challenges is that among prospective visitors there is limited awareness of what Kentucky offers. This challenge largely originates within the state. Elected leaders and the general public are increasingly coming to understand tourism’s importance and the need for marketing funds through which to increase prospective visitors’ awareness of what Kentucky offers. Nonetheless, there remains a significant need for more of our leaders to embrace tourism as one of the state’s most important and valuable industries. This continuing need has resulted in Kentucky’s statewide marketing efforts being among the lowest funded among the 50 states and also among nearby competing states. One needs to look no further than Tennessee to see cities whose tourism funding is greater than that of the entire state of Kentucky. In addition to limited funds, dedicated tourism funds are at risk of being diverted to non-tourism uses. In 2014 $9 million in one-percent tourism marketing funds were “swept” and placed in the state’s General Fund budget. (We were gratified that in the 2016 legislative session, the Governor and General Assembly did not sweep tourism funds.) At the local level officials sometimes divert tourism funds for other purposes, and some support legislation that would divert up to 75% of restaurant tax monies to city government and away from tourist commissions. These constraints on Kentucky’s ability to market itself are occurring as other states are increasing their investments in tourism marketing, placing Kentucky at an increasingly weakened competitive position.